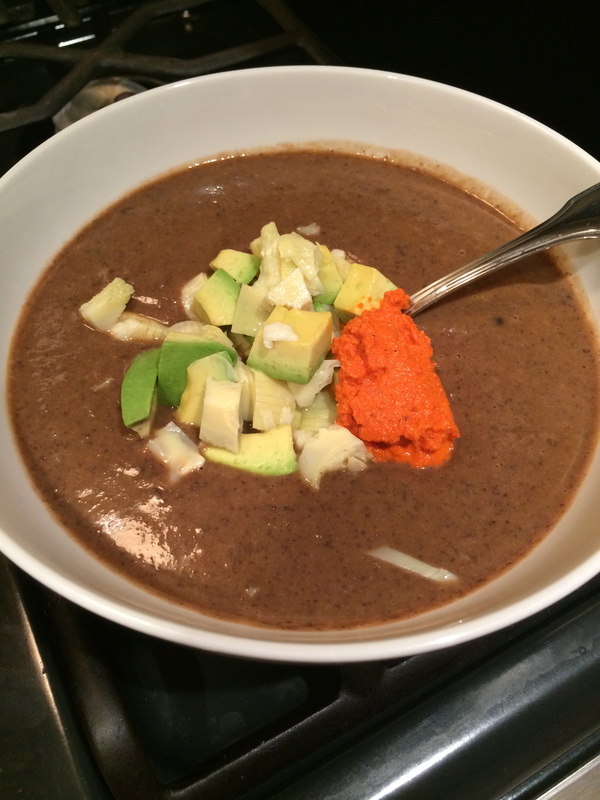 This is one of my all-time favorite winter soups. The caramelized onions and sherry impart an incredible richness to the broth, and the potatoes keep it feeling like comfort food. Preheat the oven to 350 degrees. Pour several tablespoons of olive oil in a baking dish and add 2-3 tsp of Italian seasoning and some salt and pepper. Add the chicken tenderloins and toss to coat. Set aside. Melt olive oil and butter in a large soup pan, then add the onions once hot. Once the onions have begun to get nicely colored, add the garlic and stir for about 45 seconds. Then deglaze the pan with 1/4 cup of sherry and stir till the sherry has soaked in/evaporated. Do the same with the remaining 1/4 cup. 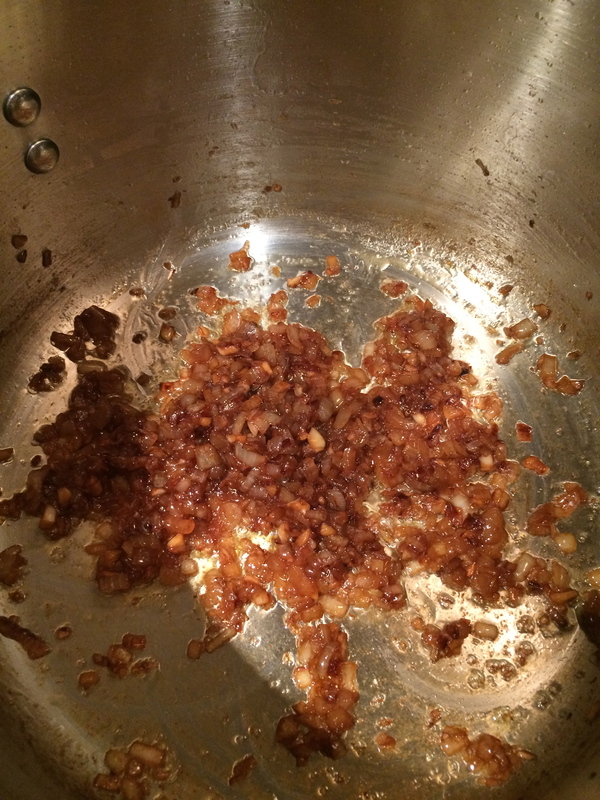 As you continue stirring, the onion and garlic will caramelize beautifully. Add more butter to the pan while you stir if you really want to amp up the richness. Add salt, pepper, and paprika, then add the chicken broth and the potatoes. Place the chicken in the oven. Bring the broth to a simmer and set the timer for 15-18 minutes. Simmer until the potatoes are cooked through and soft. 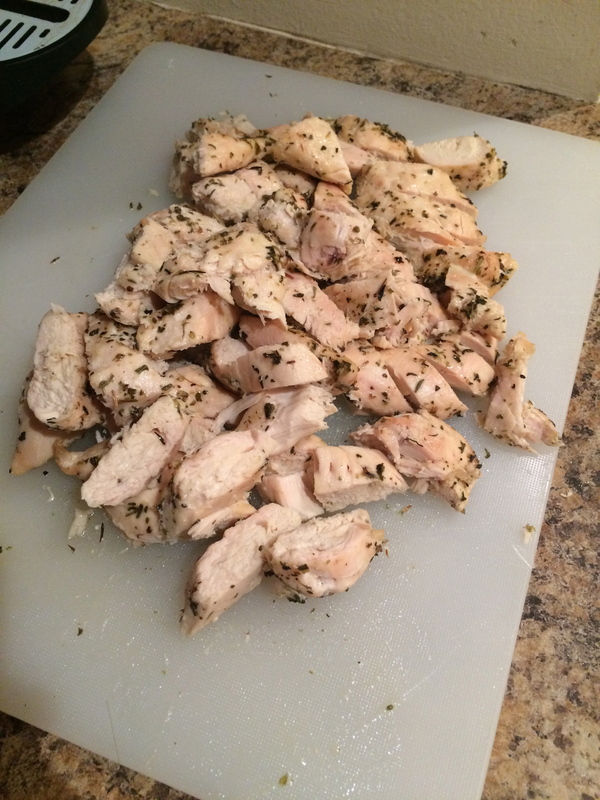 Check the chicken and if done, remove from the oven and place on a cutting board to cool. At this point, you can puree a little bit of the soup to thicken the broth, or you can leave as is. Dice the chicken and add to the pot. Taste the broth and season more if necessary. To serve, place a handful of baby green in the bottom of each bowl and ladle the soup on top. The hot broth will wilt the greens just perfectly. This is also really good with crusty bread and some nice Chardonnay. Saute the diced red onion in some olive oil until slightly carmelized, then add the garlic. Cook, stirring occasionally, for about 1 minute, or until the garlic is fragrant. Be careful not to burn. Add the spices and stir for another minute, then add the beans and the broth. 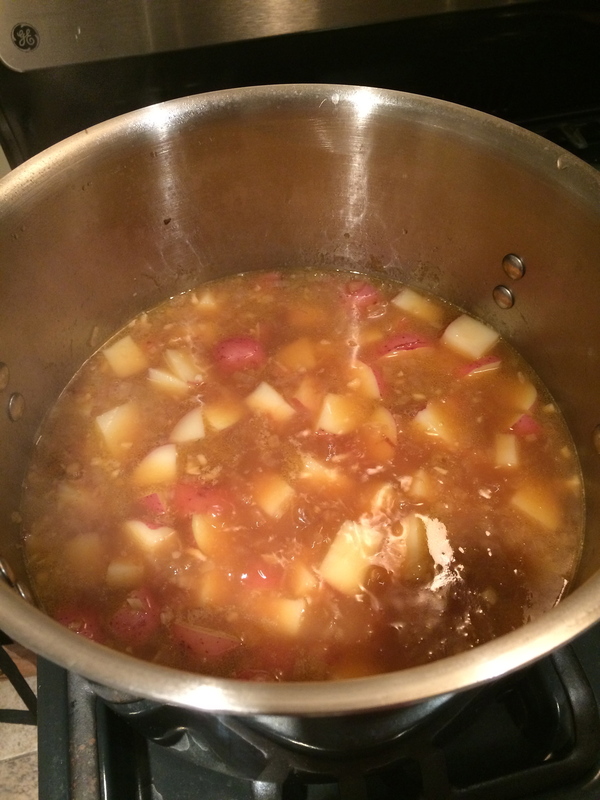 Heat through and allow to simmer for about 15-20 mins to allow the flavors to come together. Puree about 2/3 of the soup in a blender and then add back to the pot. Top with diced avocado, artichoke hearts, and fire roasted red pepper pesto if desired. Soak the chickpeas overnight. Put the chickpeas and their soaking liquid in a large pot. Bring to a boil, cover, lower heat, and simmer gently for 1 1/2 hours or until tender. Strain the chickpeas and save the cooking liquid. Combine 2 T onion, 1/2 tsp salt, green chilli, ginger, and lemon juice in a teacup. Mix well and set aside. Heat oil in a heavy, wide pan over medium-high heat. Add remaining onion and saute for 8-10 minutes. Add the tomatoes. Continue to stir and fry for 5-6 minutes, mashing the tomatoes with the spoon. Add the coriander, cumin, and turmeric and cook for about 30 seconds. Add the drained chickpeas, 14 oz of reserved cooking liquid, remaining salt, garam masala, and cayenne. Bring to a simmer. Cover, reduce heat to low, and cook very gently for 20 minutes, stirring occasionally. Add the mixture in the teacup. Stir just to blend. Serve hot or lukewarm. From Madhur Jaffray’s Indian Cooking. Good with basmati rice and a vegetable (cabbage and peas, or green beans and tomatoes). *Depending on your chilis, a whole one can be really really spicy. I regularly halve the amount of chili and cayenne and then add more if I want it. In medium saucepan, bring the coconut milk and water to a boil. Add quinoa and salt, reduce heat to low, and simmer, covered, for 15 min. Add extra liquid if necessary. Stir in poppy seeds, lemon zest, and honey. Serve hot, topped with nuts and additional milk. Adapted from Super Natural Every Day, where it is made with bulgur wheat. Edited to say that I think in future I would use more coconut milk or less quinoa, since it turned out pretty dry and not very cereal-like. Here’s a recipe sure to bring back memories of hot summer nights. I think this would also make a refreshing lunch to pack, now that school has begun. Av, Amy & I are off gluten, so looking for lunch ideas especially. Check out the book “Wheat Bellies” & you may all choose this path of gluten-free. Gently simmer chicken breasts in which covers the chicken. Do not let boil as this makes the chicken tough. Cool and cut into 1-inch pieces. Mix above ingredients together and set aside. Cut fruit up and mix with: 2 teaspoons canola oil 2 teaspoons lemon juice (I have made this without using the oil and lemon juice; it is good either way.) Can be made up to 1 day ahead. Just before serving, line a platter or individual plates with red leaf lettuce leaves. Mound chicken salad in center and surround with fruit. Makes six 6-ounce servings. Dana made this for her lunch today and told me about it. I’m going to have it for lunches next week at work. You could add diced ham, or tuna, or salmon, to make it a more substantial meal or for extra protein. Combine the mustard, vinegar, and 3 T extra virgin olive oil in a salad bowl. Season. Chop the broccoli into tiny trees and toss in the dressing. Chop the avocado in half and scoop bite-sized chunks into the dressing with a spoon. Toss the salad to distribute the dressing and serve with almonds on top. Those with nut allergies can substitute red onion. This is a recent successful combination of several minestrone recipes (Joy of Cooking and Love Soup). It does involve lots of chopping, but it makes a big pot and keeps beautifully all week. I’ve been making it on Sunday nights for the last two weeks and eating it for lunches. Saute onions in 2 T olive oil until soft. Add remaining vegetables and herbs (I just chop and add as I go, stirring occasionally) and saute for a few minutes. Add canned tomatoes, beans, and broth. Bring to a boil, reduce heat, cover and simmer for 20 minutes. Add pasta and cook for 10 more minutes. Taste and season if necessary. Serve with a drizzle of olive oil, a grind of black pepper, and a sprinkle of parmesan. Get yourself a baguette and a glass of white wine, and you are set! Variations: I keep forgetting to actually try this, but apparently you can throw in the rind from a wedge of parmesan cheese while the soup simmers, and it gives the vegetable broth a great flavor. You can also use chicken broth. If you want to be really decadent (a la Joy of Cooking), you can add two chopped slices of bacon when you start sauteeing the onions. Chickpeas are the beans of choice in the Love Soup version. I’m always a fan of either type.